Tekken is back and it's better than ever. The game franchise which has sold an unbelievable 33 million units worldwide hits consoles again later this month with the arrival of Tekken 6, and it boasts the biggest character roster in Tekken franchise history. Tekken 6 lets you master 40 unique fighters representing the world's top martial arts styles. The character line-up includes 34 beloved characters, such as Jin, Heihachi and Kazuya, as well as six brand new characters with unique fighting styles and combo systems! As for gameplay, there's now a Campaign mode, where you can jump into single player or two player online co-op campaigns to experience the intense drama and large-scale battles that unfold. Not only that, you can also create your own character, customising their hairstyles, apparel, fashion accessories, tattoos, and so on. Once done, you can take your fighter online in VS mode or Co-Op mode. If you like the sound of Tekken 6, then you are in luck as TechRadar in conjunction with Namco Bandai Games is offering a lucky reader the chance to win a PS3 Slim and a Tekken 6 Arcade Stick bundle, which is strictly limited edition. In all, the setup comes to around £500! The bundle, if you haven't guessed already, includes a customised wireless arcade stick and a stunning 100 page heavyweight art book containing a wealth of images chronicling the story, characters and the game's development. Oh, and the videogame is thrown in for good measure too. The winner will also receive an awesome Tekken goody bag, which houses such things as a punchbag, badge, wristband, T-shirt, cap and some playing cards. 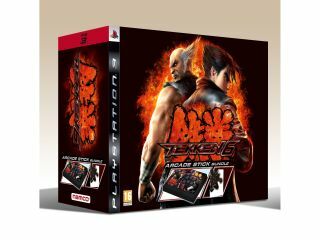 If you are unsuccessful winning the main prize, then do not fret as five runners-up will also receive Tekken 6 goody bags. This competition is now closed. The main winner is Barbara Marshall. The five runners up are Margaret Johnson, Jamie Rivers , Lucinda Duxbury, Amy Price and Simon Mcguire.